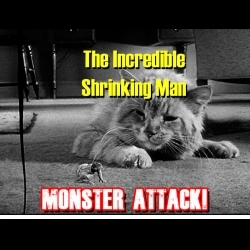 Jim examines a film he considers one of the best directed by Jack Arnold - 1957's "The Incredible Shrinking Man," written by Richard Matheson and starring Grant Williams Randy Stuart, Paul Langton, William Schallert, April Kent and Billy Curtis. A man exposed to a radioactive fog begins shrinking. How he deals with this unique and frightening situation is the subject of this week's episode of "Monster Attack!"